On Easter morning, Sunday April 5th, a dozen FFWPU members joined an interfaith breakfast hosted by UPF, WFWP and the All Saints Urdu-Hindi Church. Abbassador for Peace Steven Khan welcomed everyone and gave the initial prayer for peace and the breakfast we shared. His community is largely from the same area of Pakistan where Christians, Sikhs and Muslims share similar culture, food and language. He invited everyone to light a candle for peace. Over 40 people listened to Catholic and Protestants with a strong respect to the Easter morning. Fr. Herman Roborgh has been an AFP with UPF meetings for some time. John Bellavance expressed the Peace factor from UPF and WFWP showing their connection to the United Nations and push for a tier above the General Assembly within the UN of a Religious focused body. Indeed, one of the key note speakers, Narinderpal Singh, a representative on the National Sikh Council of Australia felt at home speaking Punjabi and eating bread made in their tradition. Randall Apps and Sue Kerr of the Geelong Interfaith Network both added their voices to allow other faiths to be the best they can while strengthening your own faith, and support each other. Rev. Esura’s daughters gave a show stopping song. We retired to the garden area to form a circle and join in silent prayer. This week our Sunday service was held at the Indooroopilly library. Due to Easter holiday many people were away. Nine people attended. John Adamedes conducted the meeting and gave an introductory presentation for new guests. We had one guest the mother of Kim Raymond. The theme of the presentation was the sorrowful heart of God. 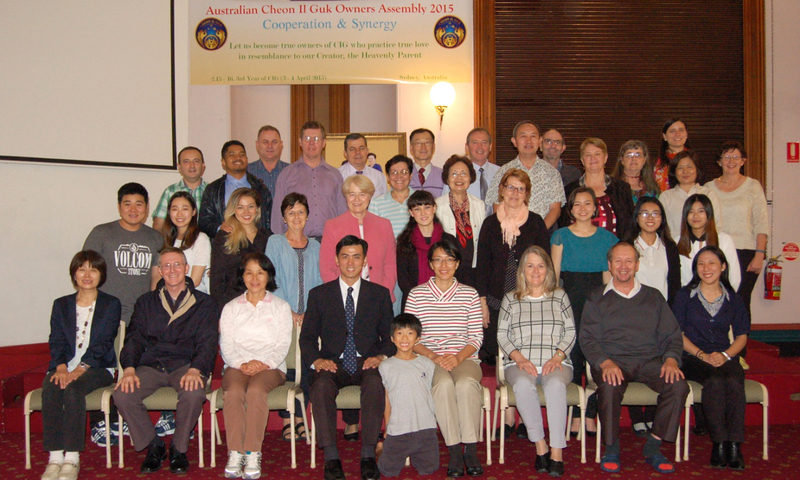 The Australian Cheon Il Guk Owners Assembly was held on April 3-4 (Good Friday and Easter Saturday) at the Oceania Peace Embassy in Sydney, with the theme, “Co-operation and Synergy”. National Leader, Rev Soon Teck Lim, explained at the start that whereas the annual national gatherings in recent years were titled as “Australian Leadership Convocations”, there was a change from this year to emphasize that all Blessed family members are to take ownership in this new age of Cheon Il Guk. Some forty first and second generation members from Queensland, Victoria and New South Wales spent the two days sharing reports and in constructive discussion on issues of relevance and concern to Unification Movement entities – the Family Federation for World Peace and Unification (FFWPU), Universal Peace Federation (UPF), Women’s Federation for World Peace (WFWP), and Youth. Some of the discussions were in entity groupings, essentially specific to the entity, whereas other discussions were pertinent to all entities. For instance, one general session focused on the issue of “good governance”, and another on preparation the third anniversary of True Father’s Seonghwa. Each participant received a well-prepared Assembly Manual with many useful content resources. Participants shared a pleasant meal at the Seoul Ria Korean restaurant on the Friday evening, and a pizza lunch at the conclusion of the main assembly on Saturday. Several stayed on to participate in networking meetings on the Saturday afternoon. The Assembly was indeed a great opportunity for members from around the Australian States to get together in a spirit of co-operation, to synergize and to be rejuvenated. There was a bi-monthly Ambassadors for Peace meeting on Easter Monday, April 6, 2015 at the Oceania Peace Embassy in Sydney with the theme “Creating A Culture of Peace through Art”. Over 70 Ambassadors for Peace, UPF supporters, members and guests attended this inspiring evening. Mrs. Aila Willitts, WFWP President, was the master of ceremony that began with an Acknowledgement to Country by aboriginal elder Ciaron Dunn. UPF Australia President, Greg Stone, spoke on the theme with an enlightening talk on the Theory of Art from the Unification Thought perspective. Then the guest speaker, Marcelle Mansour, a well-known Australian artist, writer, poet, journalist and publisher spoke about her unique, creative contemporary art work, “Threshold” which uses light for healing, renewal, birth and the promotion of world peace. Several of her artworks were prominently displayed on the stage, with the hall deliberately dimmed throughout the evening to showcase the light effects. Marcelle’s background is from Gaza in Palestine, and from this homeland of conflict and suffering, she could aspire to promote healing, noting that the word, “gauze” (used universally in the bandaging of wounds) originates from her birthplace. The attendees were then treated to a musical presentation of the Beatles’ classic, “Let It Be” by UPF youth. As always, the evening featured the sharing of food and good company with like-minded people of goodwill irrespective of backgrounds, ethnicity and religion. This Sunday (March 29 2015) 12 members gathered at Koala Park, Daisy Hill to have a worship service and BBQ together. We had 2 short readings from the Bible, 2 Corinthians 5, and Chen Seong Gyeong age. 657 and discussed the contents. We can’t create the Kingdom fo Heaven (Cheon Il Guk) by just believing in Christ or True Parents or even God but by loving Him. God is more interested in the family being saved/resurrected than individual salvation. After the meal, we planned to discuss topics in relation to the upcoming meeting to be held in Sydney so that Naoko Raymond, our representative could present our report and ideas on how we could develop local community and go forward toward the Vision 2020 goal True Mother has set for us. Trevor Newman gave a testimony of how he had break through to some degree with his tribe, forgiving the one he considered his enemy of his immediate tribe, over many years and tears. That person recently gave a monetary gift and blessing on Trevor receiving a gifted car that he half owned. True Father was his inspiration; if True Father could forgive Kim Il Sung and embrace him in love (1992) then Trevor found the courage to do the same with his tribal enemy. Furthermore, Trevor have been able to pray together with his immediate family for the health and wellbeing of his physical family. There is a lot going on in the world, and in our movement, so it is good to take time to bring topics up and hear “Abel’s” voice and wisdom from God, True Parents and any member who’s aligned with the God’s providence. Heavenly Parent expressed his love to us though his creation e.g. kookaburras and wallabies came so close to us that we could touch them (signs said not to feed them).